If you play a lot of multiplayer games, then making sure you have the best gaming router is essential. These routers have been specially designed to prioritise network traffic from games, a feature known as Quality of Service (QoS), so your gameplay won’t be affected if other people are streaming Netflix or browsing the web. Many gamers feel that a wired connection is best for online gaming and streaming games via services such as Steam In Home streaming, and we’d agree. The best gaming routers should then have plenty of Gigabit Ethernet ports for connecting your gaming devices to the internet – or for playing local LAN games. Having a wired connection isn’t always possible, so gaming routers need to have the latest – and fastest – Wi-Fi technology as well, which is currently 802.11ac. Having external antennae which can be moved to direct the Wi-Fi signal to certain areas of your house is also handy to have. With the particular needs of gamers in mind, then, here are the very best gaming routers you can buy. If you’re a serious gamer who relies on having a lag-free connection that offers you the fastest – and most stable – internet speeds possible, then there really is only one choice: the Netduma R1. Don’t be fooled by its boring looks; no other router in our list takes the needs of gamers as seriously. There’s a huge range of gaming-specific features here, such as a powerful QoS feature, a geo-filter to help reduce lap, an easily-enabled VPN and the ability to block hosts who have poor connections – which could in turn affect your performance. This router is showing its age a bit, so there’s no wireless ac connection, currently the fastest available Wi-Fi technology, but then if you’re serious about gaming you’ll want a wired connection anyway. 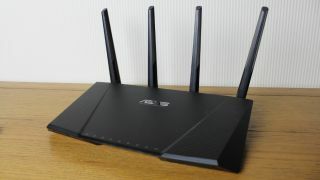 The Asus RT-AC5300 is an excellent high-end gaming router that comes with a number of advanced features for making online and network gaming as lag and frustration free as possible. This includes an easy-to-use yet powerful interface, as well as comprehensive QoS settings. The spider-like design won’t be to everyone’s tastes, but the eight antennae serve a purpose, as they can be used to direct your Wi-Fi signal throughout your home, giving this router an excellent range. It may appear as though it would abduct a close friend or family member, but we assure you, the Zyxel Armor Z2 AC2600 isn’t as alien in function as it is in looks. Equipped with MU-MIMO support, which improves speeds when multiple devices are connected to the same network, the Armor Z2 AC2600 prides itself on its performance capabilities. Paired with StreamBoost, Zyxel has devised a router that can not only handle ample traffic, but it can actually prioritize bandwidth based on the needs of each device connected to it. The Asus RT-AC88U justifies its above-average pricing with unrivalled record-breaking next-generation 802.11ac wireless performance. With four antennas and NitroQAM technology, which pushes speeds further still, this router enables wireless performance that can break the 1GB/sec limit. There’s a minor catch – you’ll need to invest in a NitroQAM wireless adapter, such as the Asus PCE-AC88, to see those faster speeds. It’s worth it, though, because this router is a champion cheaper than its Asus RT-AC5300 Tri-band gigabit rival. If routers had a fashion contest, Netgear’s D7800 would be among the top contenders. Its solid black finish is complemented by a quartet of antennas. Plus it’s damn fast and bettered by its inclusion of a duo of USB ports paired with an eSATA connector. The real centerpiece, though, is the VDSL 2 modem built into the Nighthawk X4S D7800, negating the need to buy or lease one separately. The outfitted software isn’t too shoddy either; a simple Dynamic QOS system makes it a breeze to govern a multitude of devices on a single home network. If you’re looking for a dependable mid-range router that combines speed with a great Wi-Fi range and features aimed at games, then you’ll definitely want to consider the D-link DIR-885L/R. It has a good selection of ports, and the user interface for setting up and configuring the router is nicely designed and easy to use. It also supports DD-WRT open-source firmware, which makes this a flexible and powerful gaming router.